Daoud Hari discusses The Translator: A Tribesman's Memoir of Darfur. 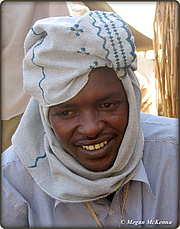 Daoud Hari discusses Tolken fra Darfur. Den 15. maj er Amnesty International og forlaget Lindhardt & Ringhof værter for et gå-hjem-møde med Daoud Hari, tolken fra Darfur, der har givet journalister verden over mulighed for at formidle sit hjemlands tragedie. Daoud Hari giver i sin bog 'Tolken fra Darfur' læseren adgang til den ellers utilgængelige Darfur region, hvorfra medierne så sjældent rapporterer. For efter flere år med de samme voldsomme historier om drab, plyndringer og voldtægt er nyhedsværdien efterhånden dalende. Men konflikten er langt fra overstået, og som Daoud venter flere millioner mennesker fortsat på at kunne vende hjem. Daoud Hari reads from The Translator: A Tribesman's Memoir of Darfur. After being driven from his home in the Darfur region of Sudan, Daoud Hari used his high school English and offered himself as a guide and translator, assisting journalists and aid groups. Hari tells the story of his journeys, risking his life to ensure that the story of his people is told. He has served as a translator for the New York Times, NBC, and the BBC, as well as the United Nations. The Translator was a LibraryThing Early Review selection. Talk, Q&A, book signing. Cost $5. First Parish Church is at the corner of Church Street and Mass. Avenue, Cambridge, MA 02138. (617)661-1424 ext.5. An in-depth discussion with experts on the political and economic interests fueling the conflict in Sudan and the policies needed to bring an end to the hostilities and relief to the victims. Cost $25 program only, $35 for program, cash bar and light hors d'oeuvre reception with speakers; cost reduced to $20 or $30 for World Affairs Council members. Daoud Hari is currently considered a "single author." If one or more works are by a distinct, homonymous authors, go ahead and split the author. Daoud Hari is composed of 2 names. You can examine and separate out names.